Aug 24, 2018: Guru Sahib Ji uses many metaphors and analogies to demonstrate concepts in Sikhi. In this post, we’re going to go over just one analogy, how a Sikh is (or should be) like a lotus flower. A lotus is a gorgeous flower that lives in the water. Its roots are submerged in muddy water or the pond. Its leaves float on the surface of the water and have a special characteristic whereby they never get wet: water literally just rolls off the leaves. No matter how many waves thrash about or how high the water level rises, the lotus always floats and stays above the water: it never sinks. The flower sits prominently on top of the leaves and always faces upwards towards the sun. Reminder: Bhai Gurdas Ji is HUGELY important. His writings were given the status as the KEYS to understanding Gurbani. Therefore, Bhai Sahib Ji’s Bani help us to dive deeper and truly grasp the basics of Sikhi. The following are by no means the only places that Bhai Sahib’s Bani mentions Sikhs living as lotus flowers. Nevertheless, as you read the following pangtia, it will become obvious why Bhai Sahib Jee’s Bani was given so much prominence by our Gurus. Also, hopefully it will become clearer how Sikhs are supposed to be like lotus flowers. We Sikhs, like lotus flowers, live in the world, the muddy water. No amount of water or rain or muck (worldly highs or lows) should ever drown us or affect us; instead, we should always be floating and level. Accordingly, Sikhs should demonstrate a certain level of detachment from the world, despite residing within it. 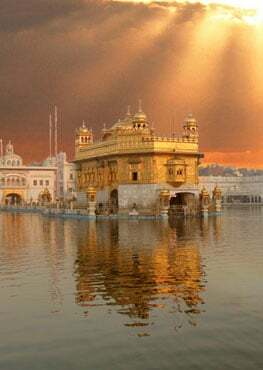 This detachment comes from always having our faces towards Guru Ji (the sun). In doing so, Sikhs become attached to Guru Ji and we bloom when Guru Ji is present in our lives. 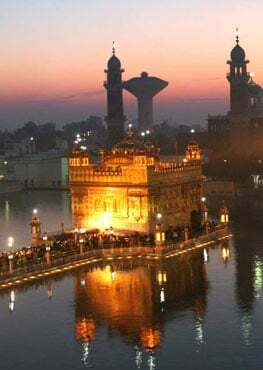 Like lotus flowers, Sikhs should give off the beautiful fragrance that comes from being Connected with the One. Then others, like the bumble bee, can come enjoy the teachings of Sikhi and the solace a Sikh provides. 1. Remember death. This one will really get us living like a lotus in no time! Try to go through the exercise of thinking that you only have 3 days (or 7 days or 30 days) left to live. What would you do? – This activity will only be fruitful if we keep in mind the purpose of life and work towards achieving our purpose in those days! 2. Reflect on our life’s purpose and make a plan towards achieving the purpose of life (related to #1). 3. Wake up Amrit Vela. 6. Before undertaking activities, remember Guru and/or Waheguru (ex/before eating, sleeping, going to school, starting work, etc.). 7. After activities, remember Guru and/or Vaheguroo (ex/after enjoying an activity, after reaching home or whatever destination, after a day’s work, etc.). 8. Do Waheguru-Waheguru Jap, whenever possible, like when walking or exercising (step with one foot Wahe, and when you step with the other foot, Guru… do this often enough and you get into a sweet rhythm and you end up being sweeter because of it too!). 9. Listen to Salok Mehla 9, while also reading the meanings. 10. Practice mindfulness and purposefulness. We should aim to always be mindful and purposeful about our thoughts, words, and actions. Living life like a lotus really means to keep our focus on our purpose of life, to keep our lives centered on Guru, and to still live within the world (as opposed to living as ascetic hermits), yet also somewhat removed from the world. To live somewhat removed from the world means that the rollercoaster of life doesn’t affect or phase us, just as the lotus flower always sits atop the water’s surface no matter how high the water gets. Guru Ji has installed all of these ways to help us achieve this standard of living, including the 10 practical, actionable steps enumerated in this post. As long as we always keep our faces towards Guru Sahib Ji, as the lotus keeps its flower facing the sun, we’ll be working towards achieving this way of mind and way of life.